Are you looking for a way to send out affordable wedding Save the Dates that don’t cost an arm yet still look great? Let me help! Here at Friday Wedding Photography the goal is to help brides get their best value for the money, so hopefully this recommendation helps! So let’s start at the beginning. You’re looking for some cheap postcard print that you can send out as “save the date”s. Normally the suggestion would be to just Google “Postcard Printing” and you’ll find some great deals on businesses competing for your attention. Personally, I really REALLY really liked www.OvernightPrints.com because they allow spot gloss for f.r.e.e and they use sturdy paper that feels really professional. Their printing is spot on sharp, they offer super fast printing if you need it, and they offer a really nicely finished product. Currently they’re running a deal for postcards so you can get some really good rates for mailers, promotions, save the dates, vendor giveaways, etc. 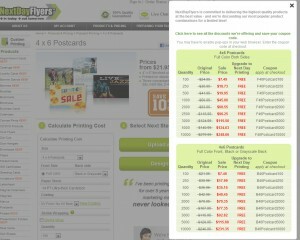 Another company that I’ve used an really liked is www.NextDayFlyers.com . They have a very similar printing quality in terms of paper, however they aren’t quite as sharp in detail. It’s slightly more of a “press printed” look, however with the UV gloss coating they still turn out really nice. They often have the best pricing. Comparing to photo labs that specialize in photographic printing rather than just press printing, both of these press sites usually offer WAY cheaper prices than the labs and even deliver thicker card stock. My last recommendation isn’t really for postcards but for just top quality small press printing. www.moo.com offers incredible high quality thick printing that’s very unique in that every card can have personalize designs. So you can order a save the date that has the invitation saying each guest’s name on it. This is just one more way to personalize your guest’s experience. If you’re really curious and have some time before you need to send out your affordable wedding save the dates, just go to all of the top recommended printers and fill out their FREE SAMPLES request on their sites. They’ll mail you samples of their main sellers and anything you’re interested in, then you can compare for yourself. If you’re in more of a time crunch and you’re like me, I’d suggest www.OvernightPrints.com and if you’re looking for more expensive and super thick printing skip the postcards and check out the fancy pants www.Moo.com .